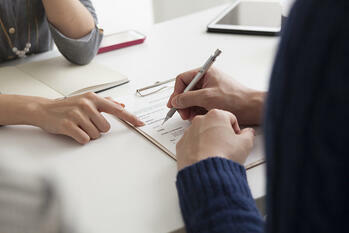 There are several documents included in the mortgage application process. In this post, we'll take a closer look at one of them: the mortgage agreement. A mortgage agreement is a document that states the contract between the lending financial institution (mortgagee) and the buyer of the home (mortgagor). In this contract, the mortgagor is granted access to the money they are borrowing from the mortgagee. In return the mortgagor agrees to vacate the property if they stop making payments. WHAT'S INCLUDED IN AN AGREEMENT? > All mortgage agreements must be notarized before they can be filed with the County Clerk’s Office. A copy will then be sent to both parties once it has been recorded. The mortgage process can be a little complicated and that’s why Cyprus Credit Union is here to help. Our experienced advisors will there to assist you every step of the way. If you would like to set up a no obligation meeting, you can click HERE, email mortgages@cypruscu.com, or call (801) 260-7600 ext. 5340.